It is actually a new hotel with a dorm in a historic setting. Very pleasant and comfortable. I stayed here for one night. The hostel was honestly the best part about the trip! The staff was extremely helpful. The receptionist also recommended places/cafes to see. The beds were comfy, sheets were clean and tidy. The bathrooms were super clean too. They provide lockers that work with a key card. There’s also a nice bar/cafe located by the hostel so that was plus point since I arrived pretty late at night. I would definitely stay here again!! A truly outstanding place--great location, central and secure, and with very friendly, highly professional staff. Great restaurant downstairs. Highly recommended! The hostel was great! The concept and decor was unique, the bathrooms were clean, and the staff was attentive, efficient, and friendly. The rooms were straightforward and simple, which was good. My only comment was that the blankets were so stiff and always made noise whenever they were adjusted/moved. 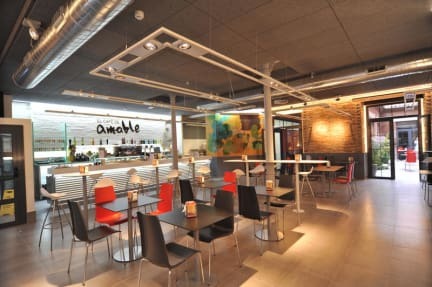 Very nice modern hostel, extremely clean and well situated. The staff extremely helpful. We could not find the parking area so the receptionist got in her car and we followed her. For us that went beyond the call of duty. We would still be driving around now. The hostel is so nice! I wish the same one existed in Madrid, I’d stay there every time. It is only a little walk from the centre of where the shops and park are. 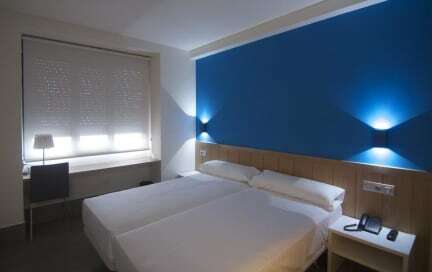 The rooms have comfortable beds and good lockers which lock with the electric room key also. This really beats bringing your own lock! The beds are already made and you even get a towel for free included. It’s the first time I’ve seen that. The only criticism I have is there’s nowhere to hang your clothes inside the shower. An excellent place to stay. It's right in the centre of town, and is surrounded by bars, cafes and places to eat. The rooms were spacious and comfortable. A book-swap library and a shared kitchen is available, and each bed comes with towels and a locker. Staff were very friendly and spoke both English and Spanish fluently. The only cons would be that I had to swap my bedding over because there was some dried blood on it, and I couldn't lock the door in one of the men's showers.